The Crumpet: NEW31DC - Wanna Take It Slooooooow ? NEW31DC - Wanna Take It Slooooooow ? A lot of you commented that you'd have loved to do the NEW31DC but that 1 mani a day was just too much. 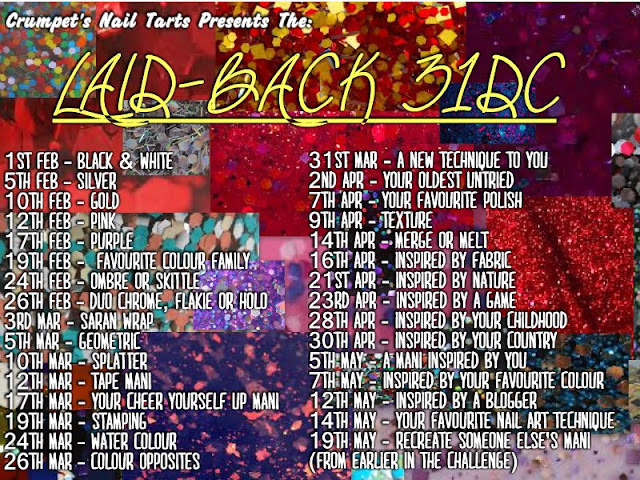 Welllllllll, Crumpets Nail Tarts are re-running the challenge from Feb 1st, but at a pace of just 2 manis per week, so that most people can find a way to take part. All the original Inlinkz codes will still work, so you can hook your mani up to everyone who did the challenge in January. So, what are you waiting for? Just click the Crumpet's Nail Tarts logo on the left, join us, and away we go !! NEW31DC Day 14 - Stamping - Dragons !! Crumpet Blogger of The Month - Apply Now ! Newbie Blogger Boot Camp - So You Started A Blog? NEW31DC Day 3 - Gold .... ah!